I love flavors. Don’t like it when the same taste (spanning weeks) dominate the flavors of our home food. Variety is key. Ahh, how I enjoy a see-saw of sweet and sour, of spicy and zingy… my palate is insanely adventurous. Today, I decided to do a tapenade-grilled beef tandem. Tapenade is an extremely popular dish in France. It is used as spread on breads or fillng in fillets or paninis. The original recipe calls for olives, capers and anchovy fillets, mixed together and finely chopped. Now my version, coarsely chopped. LOveet! Biting into these roughly chopped olives and capers excite my palate. The play of salty and sour in these two great ingredients take me to some great gastronomic trip. The meat that went with it was actually some sliced beef burger that I earlier cooked. 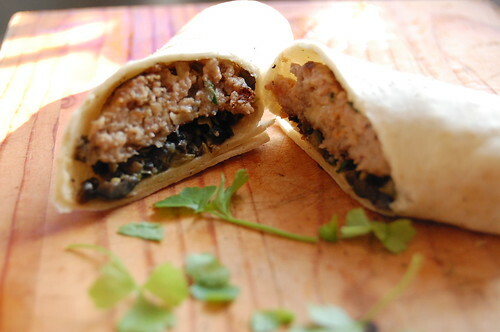 The tapenade would be the meat topping, wrapped in some warm pita bread. The tapenade will call for 20 pcs black pitted olives, 2 tbsps capers, 3 tbsps lemon juice, 1 tbsp mashed anchovy fillet (optional) and 3 tbsps olive oil. 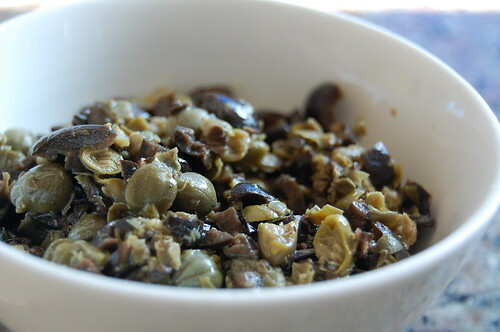 Coarsely chop the olives and capers, mix in anchovies, lemon juice and olive oil. Set aside. Tapenade can keep well in the ref for upto 2 weeks. Meantime, to prepare the burger meat, season 1/2 kilo of ground meat with salt and pepper. Add 1 beaten egg, 3 cloves of chopped garlc, 1 minced onion and 3 tbsps flour. Mix all ingredients together. 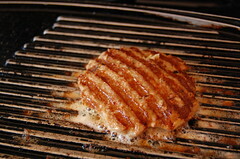 Form patties and grill. Let rest for 3 minutes. Slice into 1 inch width or your desired size. Meantime, warm some pita bread (available in most supermarkets). 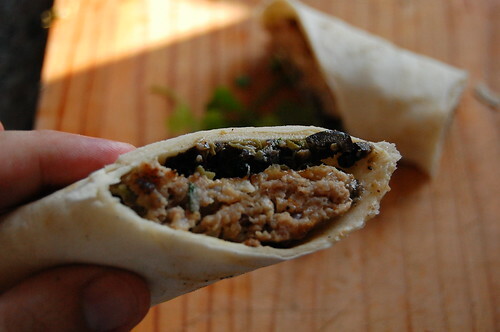 Place some sliced burger on the center, top with tapenade and fold pita with the meat-tapenade fillng inside. Thanks for sharing this reicpe! 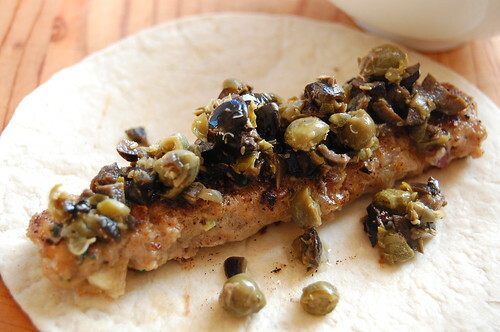 I had tapanade at Cafe Mediterranean, and I really like the taste of olives and capers…love it!